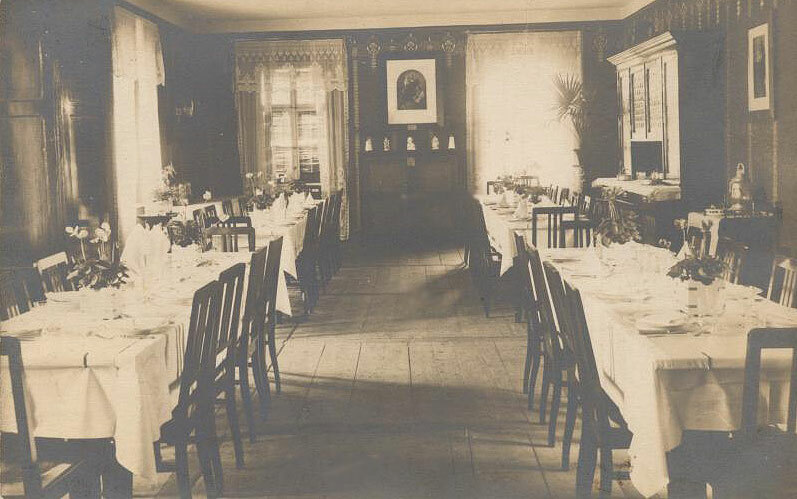 Photo of a Lyubar synagogue circa 1912-1914 from An-Sky Collection. 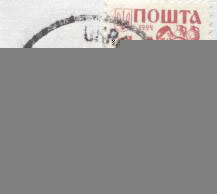 and a Lyubar postmark in 1999. Jewish faces of Lyubar - past and present. Trip photos to Lyubar, Ukraine taken in 1997 and 1999. Group photos from annual gatherings at one of two mass graves in Lyubar. 49 photos of Jewish Lyubar residents on Yad Vashem's Online Photo Archive. YIVO's "People of a Thousand Towns" online photo archive shows the Jewish agricultural settlement in Lyubar 1925-1926. Website of an architecture catalogue of Volhynia and other places during the "Napoleonic" era of the 19th century (1807-1883). 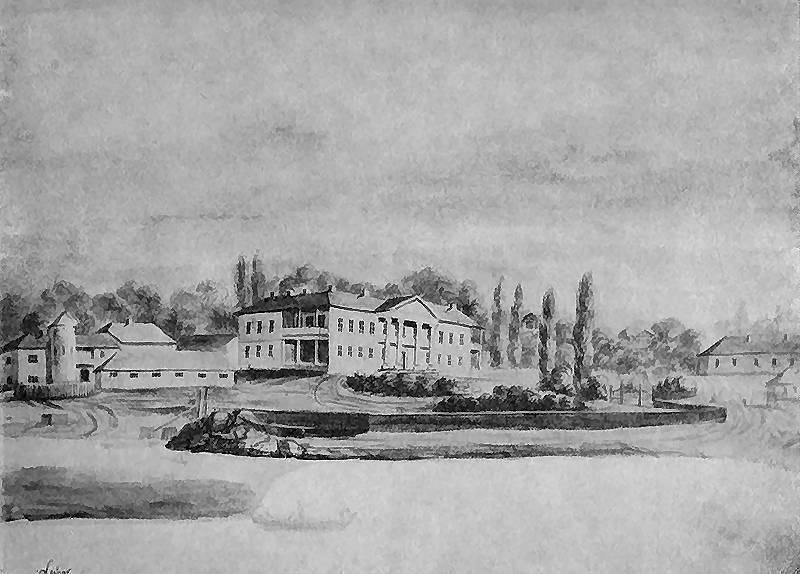 The drawing below are of a Lyubar Catholic church and the noble landowner Vodzitsky estate. 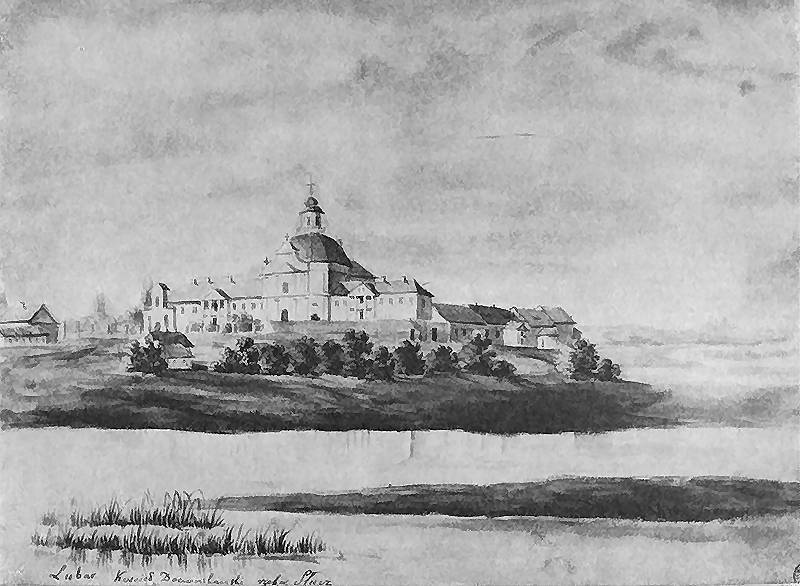 St. Michael and John of Nepomuk and the Monastery. View from the Słucz River. Church with a dome above the nave; on both sides, two-story cloister buildings with column portico; in the revival arcaded belfry-gate. Inscription: Lubar Dominican Church; the Słucz River; inscription on the foundation: Lubar. Volyn. 1862-1876. Pencil drawing painted with watercolors. 20.5 x 27.7 cm. National Museum, Krakow. III-R.A. 4186 (Teka Volyn). View from the Słucz River. Two-story palace with a column portico in great order and loggias in the side elevations; around farm buildings. Inscription: Lubar; inscription on the foundation: Lubar, - palace. Volyn. 1862-1876. Pencil drawing painted with watercolors. 20.5 x 27.7 cm. National Museum, Krakow. III-R.A. 4188 (Teka Volyn).